This is the members-only sequel to the Stolen Hearts quest. 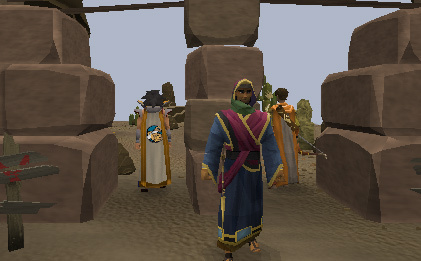 It was released with the graphics update of Al Kharid. 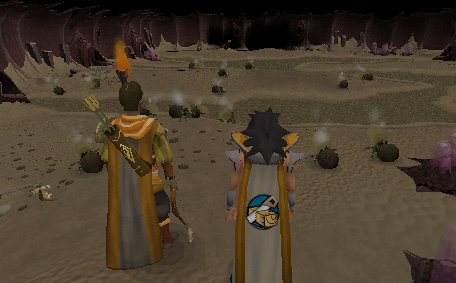 Work with Ozan once again in an attempt to steal the diamond! 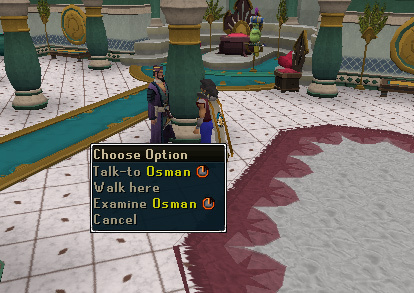 Speak to Osman in Al Kharid palace. After completing Stolen Hearts, you will automatically be given the option to start this quest by speaking with Osman. If you'd like to take a break between quests, you can come back and start it anytime by speaking with Osman in the first floor of Al Kharid Palace. He will send you to speak to Ozan and have you both meet him at the vault. Ozan is outside of the palace. You will both automatically speak with Osman in a cutscene where he will tell you his plan to rescue Prince Ali. After that, click the Het Scales and you'll automatically be given the heavy weight that you received in Stolen Hearts. Climb up the rope behind the Het Scales to arrive on the roof. 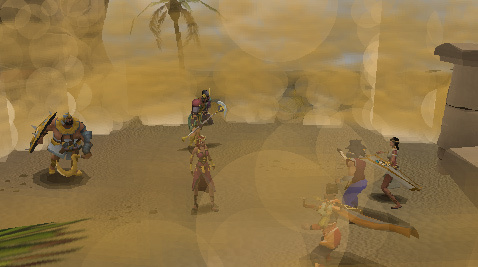 From here it would be easier and safer to just teleport using the Al Kharid lodestone. The next step involves going into the desert. Walk south and around the palace from the lodestone to the Shantay Pass. If you have any outdated Shantay passes, you will be stopped and the diamond will speak through Shantay. You will receive 4 waterskins from him before you enter. Ozan will comment on the strange occurrence with Shantay and then ask if you'd like to continue. When you tell him "yes", the diamond will opened creating a piercing sound. A sundial will lead the way. 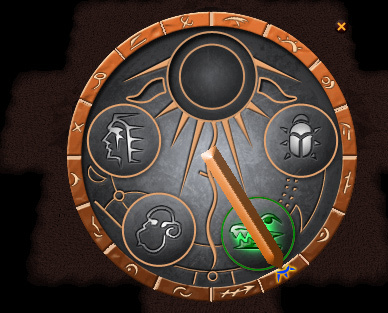 You will have to make the sundial align with the symbol it is associated with. An example would be Het. He is a human, so you would point the sundial to the human face. A little ray of light will appear in the direction of where you need to go. Follow that until you reach another sundial. Ozan will notice that something is off. You will be ambushed by bandits, one of which will speak through the diamond. They will begin to attack. There is one level 3 bandit king and five level 2 bandits. If you are a lower level, don't be afraid. You will receive tuna drops from some of the bandits. One of them will also drop a sundial gnomon which is useful for fixing the second sundial to lead you to the next stop. Use the gnomon on the sundial which is dedicated to Apmeken. Point the arrow toward the monkey face. You will now be lead northwest. 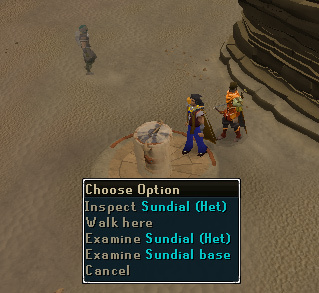 Yet another thing is wrong with the sundial in this location, and soon you and Ozan will find yourselves stuck in quicksand! Click through all the options, none of which will work. You will eventually sink and end up in a cavern, the Kharid-ib falling out of your backpack. A little bug will run away with it. 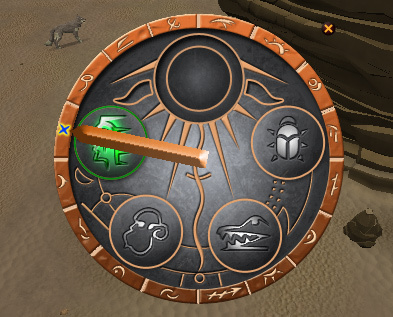 On the "bright side", you will have found the third sundial dedicated to Crondis. Ozan hurt his leg and will send you into the caverns. Whenever you enter one of the caverns, you will end up back with Ozan. Go through a few tunnels and it turns out that Ozan is sitting on the sundial gnomon. 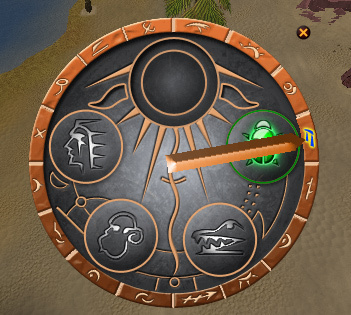 Crondis has a crocodile head, so rotate the dial to the crocodile. Ozan will not feel a rumble this time. Follow the beam of light west into the tunnels. The room you eventually arrive in will be completely dark. When Ozan finds a torch, you will discover that the room is filled with Dung Kalphites. 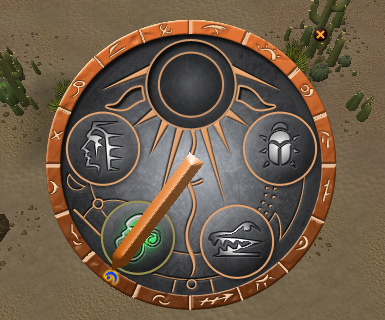 You will search for the diamond by left clicking the dung kalphites. For this you will need a slashing weapon. If you didn't already bring one, a bronze scimitar is available near the cave entrance. Ozan will help you. If you don't get the right one, you may receive Tuna, bronze armor, or gems. 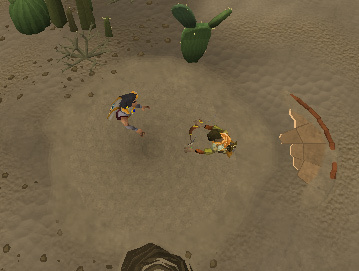 As the sound of the diamond gets louder, Ozan will instruct you to look for the sparkling dung kalphites. Keep slicing the sparkling ones until you've found a sapphire, emerald, and ruby. You will then soon find the one carrying the diamond. Pick it up and a hole in the ceiling will open up and Leela will speak with Ozan and you. She will help you escape by lowering a rope, and you will point the next sundial (dedicated to Scabarus) toward the insect head. 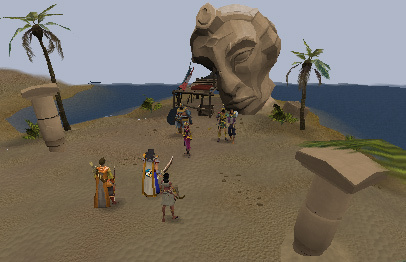 You will have to follow the sundial toward the lion's mouth, which is the Temple of Amascut left in ruins. Walk southwest and speak with Lady Keli to start a cutscene. She will become very angry when you don't hand over the diamond and will threaten the lives of everyone in the presence. If you try agreeing to give her the diamond, the diamond will speak through her guards and refuse. It will turn out that Lady Keli is Amascut. She will set her guards on you before teleporting away. There is a guard named Apep. At one point he will scream "Dervish!" That is your cue to get out of the way or be stunned. You can be blinded by Heru. Regardless of their powers, this is not a hard fight. The strength of the weapon you bring does not matter, as you will always hit a 50 as your maximum hit on them. Bringing a fast weapon will only make the fight faster. After the battle, click on Prince Ali to untie him. You will be brought to the palace with Prince Ali and Leela as Ozan goes to find the diamond. There will be a cutscene between Amascut and Jabari after an argument between Leela and Osman. 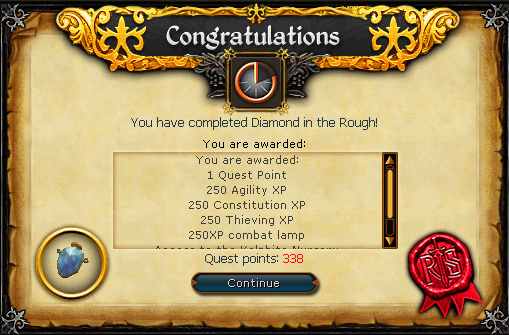 After the cutscene, quest complete!